Scottish director Lynn Ramsey went through the mill in attempting to produce a screen adaptation of 'The Lovely Bones' (later completed by Peter Jackson to a mostly negative reception) so she must have had an immense belief in Lionel Shriver's novel, 'We Need To Talk About Kevin'. Thankfully, for Ramsey, her stark exploration into failed motherhood and nature versus nurture has been extremely well received. I'm more dubious about the film's quality but firstly, I have to point out that Lionel Shriver is a woman. She's a woman. Called Lionel. That famously unisex name. Sarcasm aside, what is going on?! Then again, lead actress Tilda Swinton also reminds me of basmati rice so perhaps the onus of befuddlement is mostly my fault. Swinton portrays the mother of a particularly naughty child (the titular Kevin) who grows up to commit a horrific atrocity that haunts her for the rest of her life. The film is very much centred around Swinton's chracter, Eva, rather than Kevin, who we see in the various stages of his antagonistic childhood. 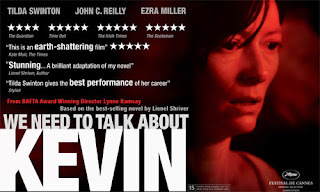 'We Need To Talk About Kevin' examines the failure of Eva, to connect with her sociopathic child, and her resulting guilt and burden of responsibility as the teenage Kevin (Ezra Miller) commits horrific acts. Unfortunately, I also felt something of a failure to connect, with the film itself. I found it increasingly difficult to grasp Eva's decision to remain in the town where her son caused so much heartache. Particularly as she'd mentioned her reluctance to move away from the big city originally, somewhere I naturally thought she'd return to. Not to mention her daily abuse. A self-inflicted punishment for her sons? Considering her own tremendous suffering and loss, I didn't quite understand the need. Perhaps more could also have been made of the nature versus nurture idea, which is less a discussion and more a cannon of blame aimed at Eva, although Kevin's naively loving father, played by John C Reilly, is equally culpable in his own way. Reilly provides one of several excellent performances, with Swinton particularly shining, and Miller delivering a sinister presence throughout. Special mention must also go to the menacing toddler who plays ball (or rather, doesn't) with Swinton. I am one of few not to love 'We Need To Talk About Kevin'. Although love is almost certainly the wrong word. This is a film which purposefully lingers while also leaving me as disconnected as its own inherent subject matter. 'We Need To Talk About Kevin' premiered at the 55th BFI London Film Festival and is on wide release throughout UK cinemas now.